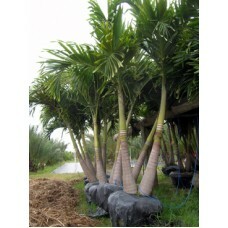 The Adonidia merillii or Christmas Palm is a very popular palm which, because of its low typical height, is appropriate for many applications. The Adonidia merillii produces a beautiful, red colored fruit around Christmas, hence the name Christmas Palm. Although not very cold hardy, the Christmas palm is still a lndscape favorite due to it's slow growth rate and self cleaning nature. 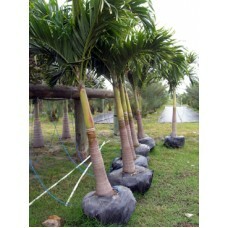 The palm produces "grey wood" as the palm matures and has a crownshaft that is lime green. The Christmas palm is naturally a single trunk palm but is common as a double, triple or even four trunk palm.